Women have always had an influential role in the prosperity and growth of any community. These roles have varied depending on the time period, geography and race of the people. America had three major groups of women: the Native Indian, the African, and the European. These three groups come from extremely different backgrounds, and played different roles in their family and community. European women in the 16-century had a specific place in the lives of their communities. They were to perform traditional roles including preparing and serving the food, weaving clothing, and raising and educating the children. 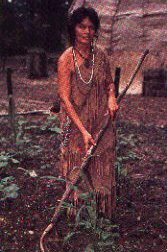 When settlers came to the New World they were appalled to see how the Native American women did all of the traditional and manual labor, according to European standards. They worked in and around the house, reared the children, prepared the food and created pottery. They also worked in the fields tilling the land and farming. What the early explorers noted was the men were leisurely enjoying their lives hunting deer and animals, fishing and building homes for their families. Doing things that the noble class of Europe did in their leisure. The image of native women in Europe was established by stories and reports sent back to the homeland. As colonies started establishing themselves there was a skew in the ratio between men and women. The interests of the Virginia Company, the first company to establish settlement in the New World, was mining. Mining was soon determined to be a non-profitable investment, so the colonist quickly switched to tobacco farming in the Chesapeake region to make money. 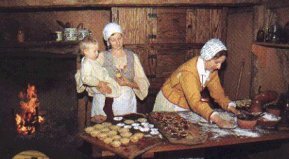 The primary workers for the Virginia Company were men, but as people stayed longer, women were seen as a way to help establish permanency in the colonies. A total of 147 women came to Virginia between 1620 and 1622. By 1624, fewer than 18 %, 230 of the 1,240 Europeans were adult women (Brown 1996, page 82). 1691 still found a 3 to 2 ratio, and the gap between the numbers of men and women didn't close until the early 18th century. Tending farmlands was hard work and during pre-colonial times, and was not suited for European women. But times were changing and tobacco was the ruler of the land. 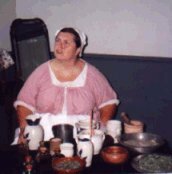 Women were needed in the new settlements and the only way they were able to make the journey across to the colonies was to contract themselves out as indentured servants for 5-7 years. 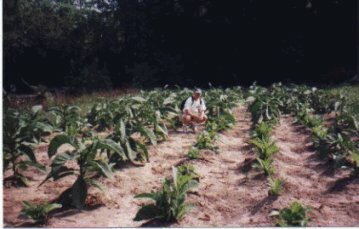 Every hand was needed to cultivate the tobacco daily from winter to the summer months. The conditions were less than hospitable for these newly transplanted European women, even for those that came from the lesser rungs of English society (Kamensky, 1995, pages 32-34). Many of the indentured servants died from disease, but those who survived their indentured period were able to marry and have land with their husbands. Africans were brought to the Jamestown Colony in 1619 aboard a Dutch man-o-war (Cobblestone, Apr 1994, page 39). They were not initially brought over as slaves but as indentured servants, because the British didn't practice slavery. 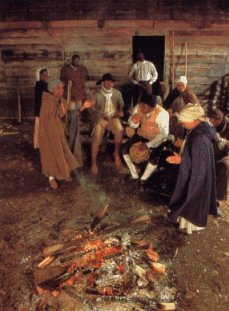 The Africans were able to complete their contracts, acquire land, and integrate into colonial society. Demand for labor to harvest crops became foremost in everyone's minds, but England's economy strengthened in the 1640's and 50's and indentured servitude had become less attractive. Most of the good land had been taken, and the Europeans were going to more lucrative colonies in the north like Pennsylvania. To cut costs on the tobacco farms, the institution of slavery in America evolved. 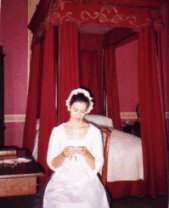 The female slave was soon to be introduced into the colonial society. When this occurred, the European women returned to their traditional roles in the home. Female slaves were primarily brought to the colonies as an investment to the plantation owner. They were able to work like the men in the fields, and most importantly could reproduce more native-born slaves, which meant more property for the slave owner. They were only able to marry with other slaves secretively, because marriage between slaves was not recognized by the colonies. Female slaves that didn't farm the land next to their male counterparts were in the homes with the gentry class women. They cared for the children of the household, cleaned, cooked and assisted in any way necessary. Working indoors was not necessarily better than working outside. 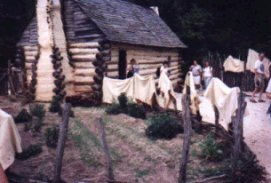 In the fields, there were groups working together out of the watchful eye of the master, but being in the house meant constant supervision and heightened risk of sexual exploitation (Kamensky, 1995, page 41). 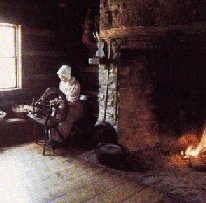 Hard physical labor like doing the laundry, carrying water and routine chores such as emptying chamber pots and making beds was expected day to day. They were also at the beck and call of their masters and master's wives 24 hours a day. The slave women that worked in the fields during the day also had to provide dinner for their families after the day was completed. Often the slaves had to have their own gardens and capture animals for food. With no days off during the week, many of the slave women faked illness, or labor to get days off work. They used this time to harvest their own gardens and take care of their own household duties. The European woman's role was greatly affected by the formation of slavery. Women who couldn't afford slave help, were often permanently put back into household duties. The day began with starting the fire, milking the cows, and creating cream and butter. She then spent the bulk of her morning preparing food for the day and bread for the dinner. The afternoons were sometimes taken up by working in the garden, mending, or taking grain to the miller. Her time also was seasonal, as she had to raise the cattle, make sausage, preserve bacon, and complete the sewing of clothes. The workload obviously didn't get easier for the women. They also had to take care of their own children. 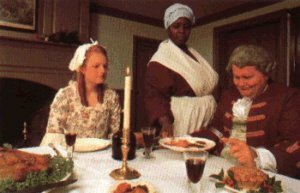 Only if the family was wealthy enough, did the wife have a slave that helped around the house (Kamensky, 1995, page 46). Taking care of numerous tasks at the same time was very crucial to the colonial women. Young children had to stay with their mothers for most of the day, unless there was a nanny or older sibling to watch. Children also learned how to help provide for the family at a young age. Sewing was something women had to accomplish during any spare time they had. Women's contribution to the development of American has changed many times. None of these changes has been easy for them. Much like today, only the wealthy had less work to complete themselves. Women definitely had a major role in creating the American fabric that appears today. They have shown us that they had to tend the fields, hold homes together, raise the children, and put up with hardships only they can understand.